FOR THE FLAG BY EMILE GRIMSHAW. 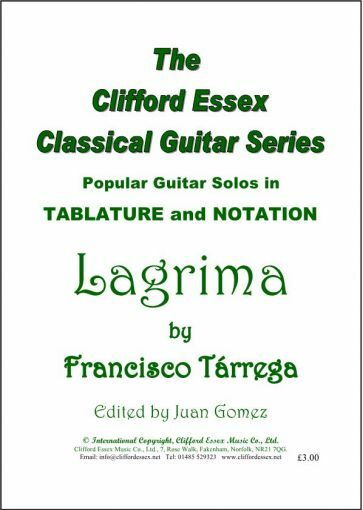 Location: /Sheet music/Guitar Series/LAGRIMA BY FRANCISCO TÁRREGA. 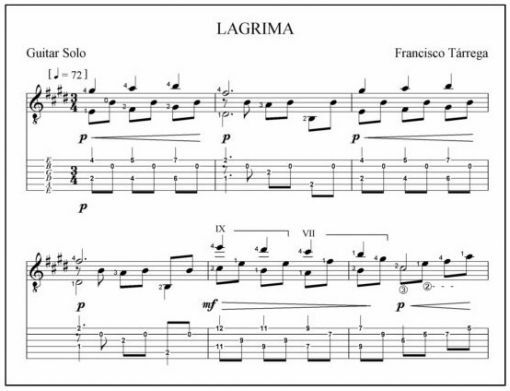 This is one of Tárrega’s famous solos, epitomising sadness. The title translates as ‘Tears’, and the beautiful melody presents an opportunity for the guitarist to express the melancholy inherent in the music. We can either send you a hard copy of this music, printed on high quality 120 gsm paper, price £3.00 post free to UK destinations and £1.50 to anywhere else. Or we can email you a downloadable file, price £1.30, and you can print the music yourself. Please choose in the options box below. GRANDFATHER'S CLOCK BY HENRY C. WORK.